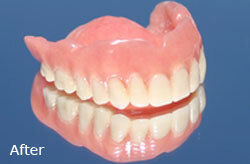 Our family owned and operated denture lab can meet all of your denture repair needs, often with same day service. 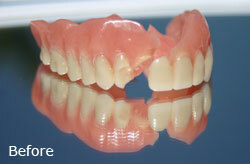 As always, you can trust our restorations are functionally correct and esthetically pleasing. Usually repairs can be completed by our experienced master technician, but occasionally the damage or wear is so extensive that unfortunately a new denture must be fabricated. Our doctors and staff will advise you as to which service will best meet your needs and budget.